Elvis Ndubuisi Iruh is a very Enterprising African. Elvis is a journalist, editor publisher of The Voice magazine. 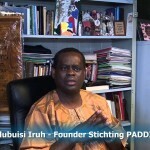 He is a philanthropist who founded Stichting Paddi. He is a pastor and missionary at the victory Outreach church in Almere. He is also the brain behind The Voice Achievers Award.